"They would all die in this dark cave. They were dead already." Another random choice and another winner -- my lucky streak continues. I'm sure that one of these days I'll go to my shelves, pick a book completely arbitrarily and find one that not's so hot, but for now, the good luck continues. "create the most vivid of fictional realms, the inner world of an Everyman battered by the cruel and seemingly random hand of fate..."
and has effectively "magnified" the horror of this "Everyman's" story in "the quietness of its telling." If I could organize words around my thoughts like this reviewer, I would be saying the same thing. "That little pebble is a condensed history of the universe that keeps the eternal cycle of matter locked in its ephemeral form." It will be these words, which "lodged themselves in his heart," that will drive Manase to begin collecting stones. As the years go by he marries, becomes very successful and has two sons; however, he finds himself becoming more isolated and more detached from his wife and children because of his passion for collecting. He also begins to find himself in situations that sort of trigger nightmares and memories and in this way, we learn little by little what actually happened to him in that cave. When tragedy strikes his family, Manase will have to come to terms with the fact that not only does the darkness of his own personal trauma often return "like phantoms to the surface of his memory" but that it also has the potential to be passed on to take root in the physical present, sort of infecting all of those around him in different ways. Consider this idea in human terms and it makes for one hell of tragic story. 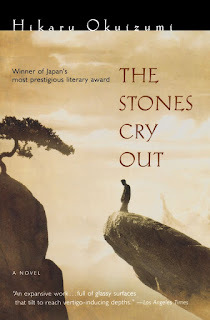 Obviously I'm just sort of outlining basic plot here, but what happens in The Stones Cry Out is best experienced rather than simply read about. This book moves well beyond simply plot to explore how memories of trauma are never really "frozen" or "locked," but rather like the crystals in the rocks that Manase studies so intently, seem to have "an inner urge to grow," even though the "urge had been forcibly repressed by some sort of magic keeping them locked inside this narrow space." The question is this: "if that spell was somehow broken, would not the minerals burst into movement?" How that plays out I won't reveal, but if ever there was a book to read that highlights the human psychological costs of war, it's this one. It's a sad but beautiful book and one I recommend.